The Great Volcano Road Trip Part 8 – Narada Falls and Rainier | Where's my backpack? Follow the road trip from the beginning here. We wound along the road to Longmire; a way peppered with waterfalls begging to be explored. Our first stop was at Narada Falls; a stunning spot where the Paradise River cascades into a small pool and then spreads a dramatic veil of lacy water over a basalt backdrop. 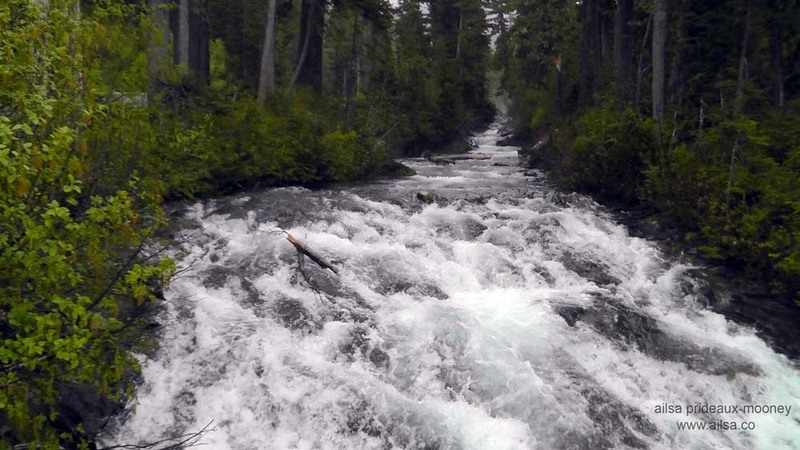 The Paradise River was thundering when we crossed the bridge to the falls, swollen by meltwater. The water runs clear because unlike many other rivers in the area, this river does not originate from a glacier but from snowfields deep in Paradise Valley. The trail to the waterfall was short, steep and slick and the roar of water grew ever louder as we approached. This is usually an extremely busy spot but because we were there so early in the season it was blissfully crowd free. The only group we encountered on the trail was a family from India; the girls clad in gaily-coloured saris scattered with tiny sparkling mirrors, glittering and twinkling with beads of water; the boys in jeans and plaid shirts dusting water droplets from their hair and assuring us the falls were spectacular. When we reached the falls we were able to marvel at the spectacle in total solitude. It was impossible not to smile at the sight of the wall of water releasing its feel-good ions. It was also impossible to remain dry; the spray it kicked off came at us full force and within seconds we were engulfed in its icy mist, gasping at the cold and giggling like schoolgirls. 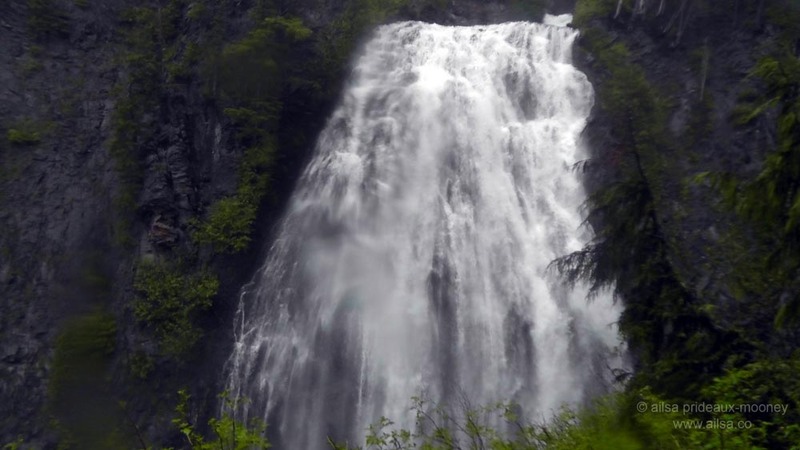 These falls were originally named Cushman Falls, but the name was neither widely known nor used. Narada was a Vedic sage who featured in several ancient Hindu texts and the name carries with it the attributes ‘pure’ and ‘uncontaminated’. 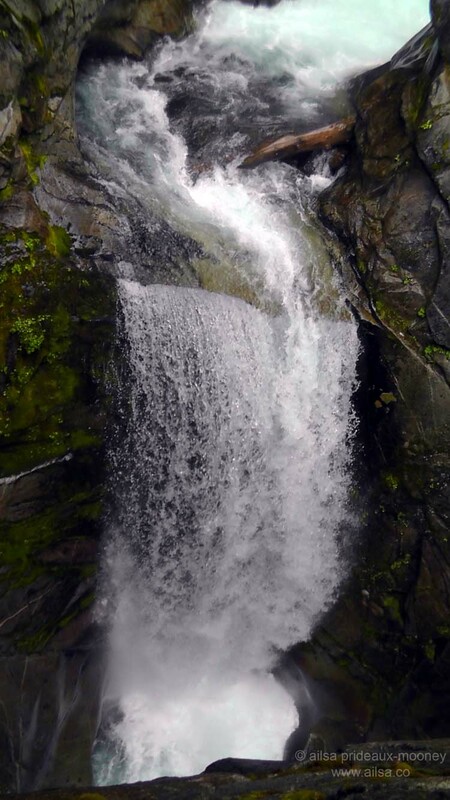 Literature about the falls suggests that a group of visiting theosophists were so taken by the purity and untarnished beauty of the location that they felt compelled to name it Narada. In the depths of winter this waterfall freezes solid and is a favourite spot for ice climbers to pick their way through drifts of icicles. With the summer thaw well underway, however, the only icicles in sight were myself and Jo, shivering from the dousing of icy cold water. Further along the road we pulled off to see the less dramatic but delicately graceful Christine Falls, named after Christine Louise Van Trump, who in 1889, at the age of 9, accompanied her father on a climb, reaching 10,000 feet despite suffering from a crippling nervous system disorder. Her father, Philemon Beecher Van Trump, together with his friend General Hazard Stevens, had completed the first documented ascent of Mount Rainier in 1870 and had guided the venerable John Muir on his ascent of the mountain in 1888. Back in the car heading towards Longmire, I was startled out of a reverie by a squeak from Jo. “Blue sky!” She pointed up ahead and as I followed her gaze skyward, I saw it; a tiny patch of blue peeping out from the thick layer of cloud that had cloaked the park all day. I grabbed the map Ranger Casey had marked and we hastened towards the southwest corner of the park with a mounting sense of excitement. Six miles later we were trundling over a little wooden bridge and following a river of stones to the spot on the map marked with an X. We were joined by a Yorkshire woman and her Canadian husband who were touring in a little camper van and had also been given the inside scoop from Ranger Casey. 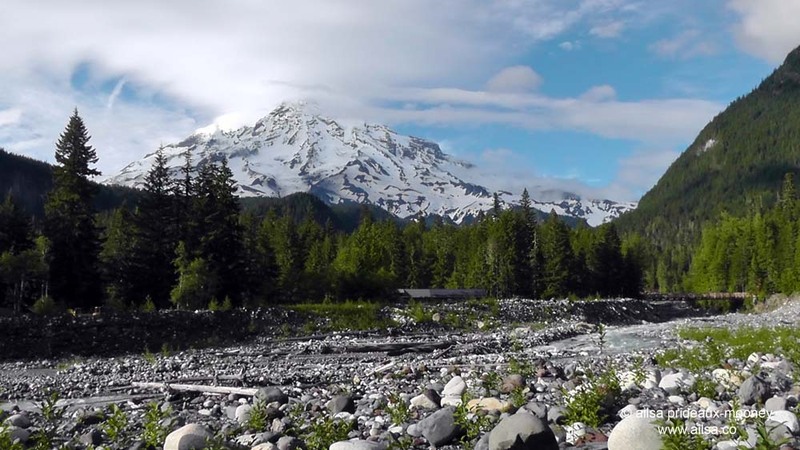 We sat on river rocks and ate sandwiches gazing up at the mountain as the clouds slowly dissipated and Rainier came into focus. 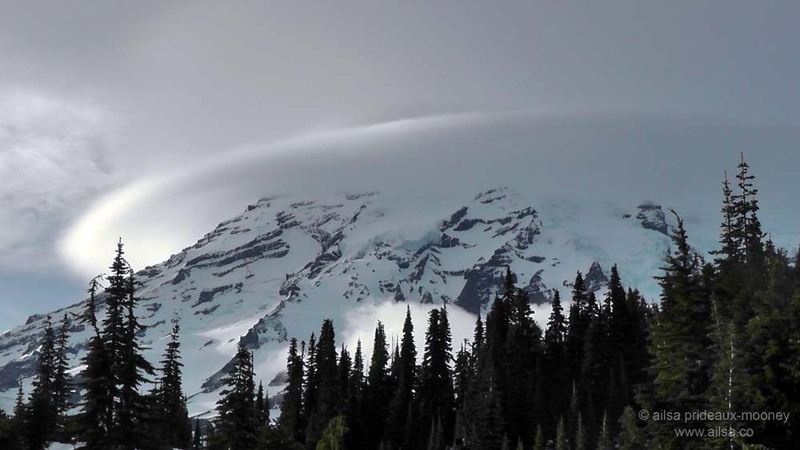 We clapped and cheered and shouted thanks to Ranger Casey as with each passing minute the mountain grew clearer and clearer, until it stood majestic against blue skies. “Let’s go back up to Paradise and see what it’s like now” Jo said, her eyes gleaming, and I happily agreed. In no time at all, we were back on the snowy slopes and climbing through trees towards the summit. Two hours earlier, there had been no sign of Rainier whatsoever from Paradise Lodge, but now, knee-deep in snow and breathing in great lungfuls of chilly mountain air spiced with the scent of pine and fir, we gazed in awe at the volcano, gleaming white and topped with its signature halo of cloud swirling around the summit. It looked like a giant, rocky Christmas tree. We climbed as far we could up the snowy slopes, only turning back when the sun began to slip towards the horizon. 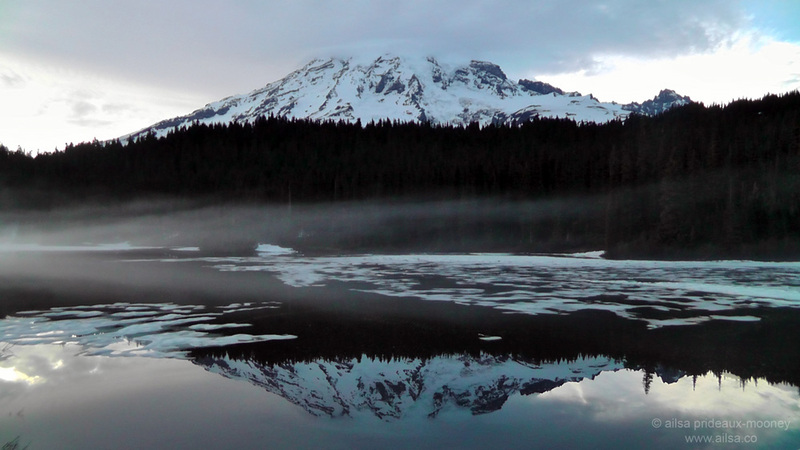 With daylight fading fast, we skirted the shore of Reflection Lakes once more, this time treated to the reflection of Rainier dancing between the pancakes of ice on the lake surface. It was one of the most beguiling, magical sights I have ever glimpsed. Passing by Box Canyon again, we spotted another great North Cascades volcano off in the distance. 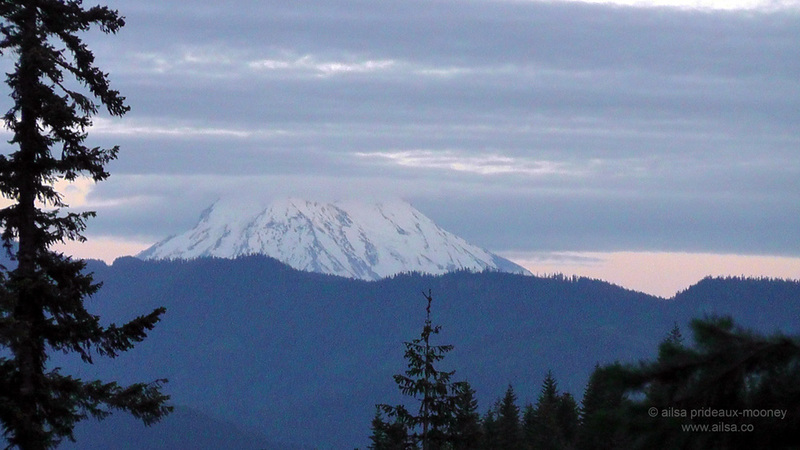 Mount Adams is the second highest peak in all of Washington state; the only peak higher is Mount Rainier. “Wow,” I said to Jo as we slowly drove away, “I don’t think this day could have been any better” but I was wrong, because Mount Rainier had one more parting delight for us; one which we nearly missed because it was taking place behind us. I had the window rolled down and let out a squeal when I noticed the view in the side mirror. 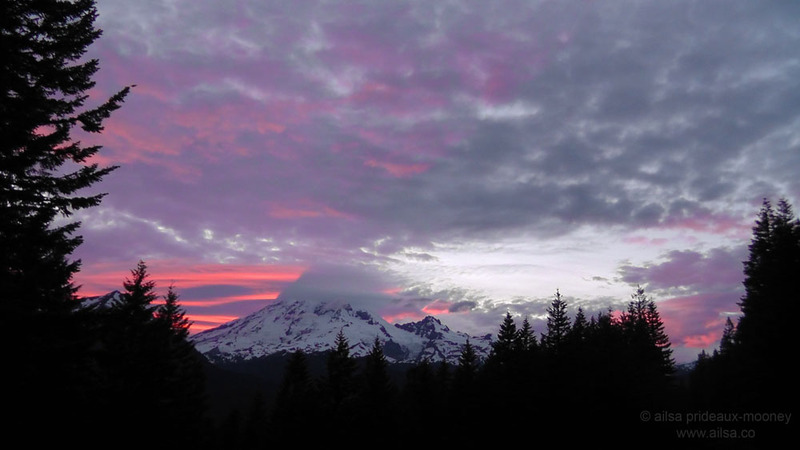 Jo stopped at the next pullout and we turned to see the mountain bathed in the glow of a fiery sunset. We stood and watched in silence until all colour drained from the sky and Rainier faded from view. Then we got back in the car and drove back to Seattle in darkness, filled with the toasty glow of a trip well-enjoyed and memories that would last a lifetime. This entry was posted in Photography, Travel, United States, Washington and tagged humor, inspiration, nature, photography, photos, pictures, travel, writing. Bookmark the permalink. What a landscape – almost too big to imagine. Thank you for sharing this elemental safari. Wonderful landscape with that sunset ! 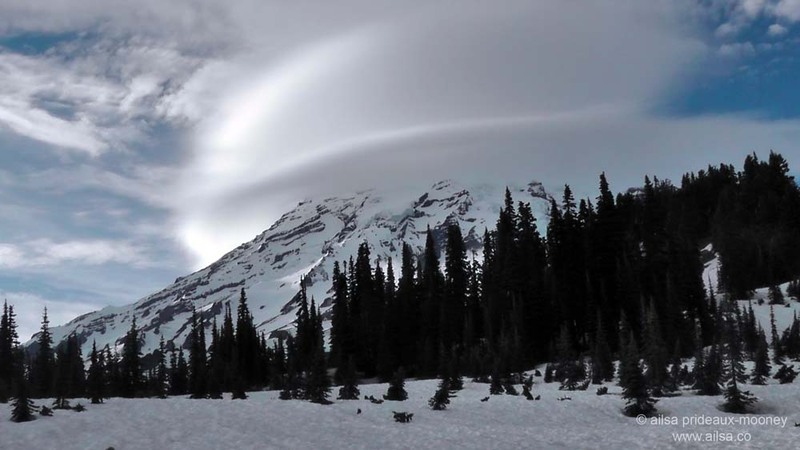 These are fantastic shots of Rainier. I especially loved the shots of the mountain pass where the trees were bent over as if an avalanche had recently come by. what sensational shots, but then you always manage to take great photos. Keep it up, Ailsa! I love those falls. Great video. Beautiful. I have not been here yet. When would be the best time to go? Thank you! Those were such beautiful images and the video was awesome too..loved the music hehe! Love the way you write..the words you use paint such beautiful pictures! I especially enjoyed the waterfall pictures-lovely! Such beauty and description I could feel myself jump in my seat at the excitement of the sunset. Thanks for the journey. The same to you Ailsa. These are beautiful photos. I was able to get some with the halo of clouds and then with the peak just peaking through. By the time we reached Paradise, the clouds were coming in really heavy. And here’s to you that wherever you travel that the luck and gods be at your side. 😀 Keep the great photos and the travel challenges coming – I’m your devoted fan.